Welcome to the Games Section of Jugglingworld. 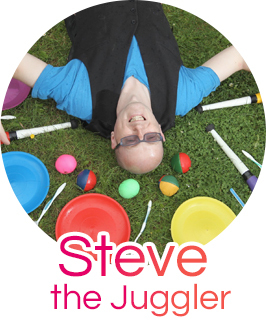 My name is Steve the Juggler and I have been involved in running and taking part in Children’s and Youth Groups for over 20yrs. Way back in the mid 1990’s, I was asked by the Church of Scotland to write a book of Games Ideas, which was then published as “Gameslist”. I described as many games as I could think of, and put them into genres (such as all the Tig games are on one page, and games with morals on another etc). I hope you can enjoy and if you have any further games for any of these pages, then please fill in the form at the bottom of the web page and I will review it and add! Best place to start is on the… How to plan a Games session page! Lateral Thinking and Problem Solving Games – exercise your Children’s brains while they rest from all that running around! If you plan on running a Circus Skills Workshop, then you might want to consider these Juggling games. If you have a Games Parachute, then here are lots of Parachute Games ideas.